Eighty years, one month and twelve days ago, the 21st Amendment to the US Constitution was ratified. This amendment repealed the 18th Amendment and marked the end of Prohibition, a 14 year period where the manufacture, transport, and sale of liquor was outlawed in the United States. Appearance: Golden yellow with a slight amber tint. Limpd: Astringent and buttered toffee. Hints of butterscotch, mint and cough drops. G-LO: Lightly sweet and fruity when I first stick my nose in the glass. Vanilla, almond paste, orange zest, coconut, some light brown sugar, and a touch of dried fruit. If you give it a bit more time, a hint of tobacco and menthol comes through. Limpd: Not overly sweet with a bit of citrus tartness (orange zest) and some pepper. A bit like a scotch-soaked Red Hot. Mid-palate, the flavors cascade more than blend to form an interesting procession of sugars, cinnamon and heat. This ends with a long, warm, caramel finish. G-LO: Medium bodied with a touch of oiliness. All of the flavors are concentrated on the front third of my tongue. A touch of sweet smokiness at the start with a warming spiciness of the cinnamon variety that builds slowly as you approach mid-palate. Definitely getting a Sherry vibe on this one with lots of dried fruit coming through. It all comes together at the finish with some sweet tobacco, dried fruit, and cinnamon flavors. Limpd: In a bit of a panic purchase, my mom had grabbed a bottle of Cutty on her way to my house one Christmas. While this might not have been my preferred blend, suffice it to say the contents were thoroughly enjoyed and the bottle properly recycled. That said, the Prohibition edition is leaps and bounds beyond Cutty. Maybe it was the higher ABV; maybe it was the healthy pour, but this was a surprisingly good blend. Not overly sweet or peaty or briny, just a nice blend of flavors and a really nice finish. G-LO: I gotta admit, my expectations weren’t very high for this whisky. While there’s nothing really wrong with standard issue Cutty Sark, it’s a bit too light for my taste. 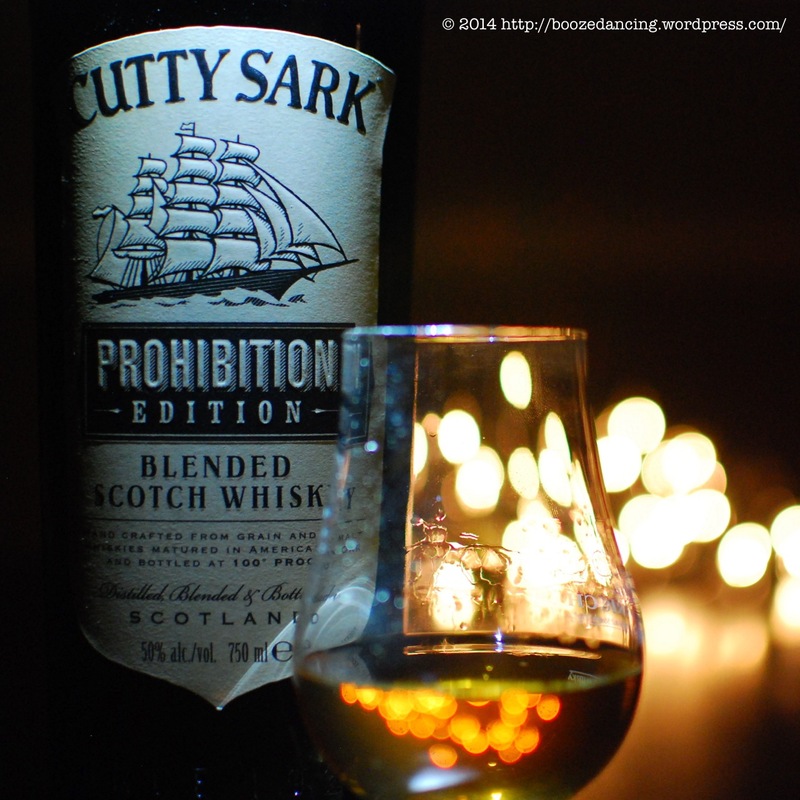 Thankfully, the Cutty Sark Prohibition Edition is a completely different animal. Given it’s suggested retail price of around $30/bottle, I’d say that this is one hell of a Scotch whisky bargain. And when you factor in the relatively high octane and smooth, rich flavors, this is an absolute steal! I really like this whisky and would definitely buy a bottle. Many thanks to Vicki Loo of 360 Communications USA for sending us this very generous sample! So I’m minding my own business (well, sort of) in a Oujai Board Google Hangout with Ernest Borgnine, Peter Falk, and the rest of the Departed Heavies Curling Club. They’ve got he brilliant idea of expanding to include some of the Departed Scandinavians Bocce Clubs but haven’t quite gotten their arms around how to license the Swedish Meatball Go Packs those consonant-slamming Nordic ghosts are so fond of. In any event, while they’re yammering on I opened another tab and started reading your Cutty Prohibition post. Out of nowhere, River Phoenix grabs the Oujai slider eye thingy and spells out S-C-O-T-C-H and all hell broke loose. Thanks to your post, I lost control of the Google Hangout (as if i ever had it) and I have to go out and get a bottle of Prohibition Edition (even though I’ve never liked Cutty Sark). Next time stick to posts on the design of fly fishing lure display boxes – I doubt River or any of the other dead party animals would wax apoplectic over something like that. So now that you tried it, what did you think? Is it a worthy accompaniment to a round of Bocce?